Today two men took an express ride to the hospital after sustaining injuries on an escalator at the World Trade Center Transportation Hub. DNAinfo reported that the escalator near the Greenwich Street entrance malfunctioned this morning as the two men were onboard. The pair met an ambulance outside that whisked them off to New York-Presbyterian Lower Manhattan Hospital for evaluation. The incident is the second this year that have sent emergency crews to the mall and transit hub in Lower Manhattan. 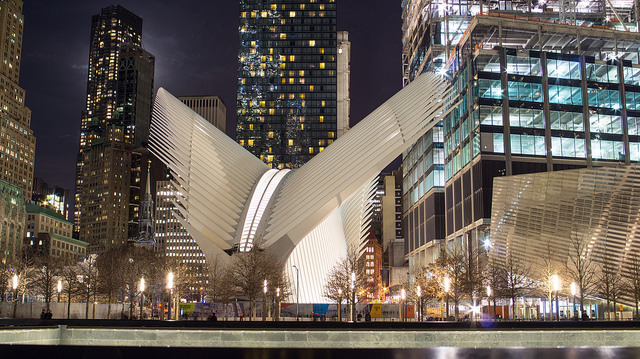 In February, a woman was killed when she fell off an escalator in Santiago Calatrava’s creation after reaching too far for her hat. April 7, 2016 White Dove or White Elephant?